One thing that often comes up is customers or people in Slack/IRC asking “How do I setup X?” I often end up making basic Vagrant stack, as all the examples on Github are either too out of date or broken. I try and pin as many dependencies as possible, and make it as easy as possible to deploy, usually doing all the work with a vagrant up. 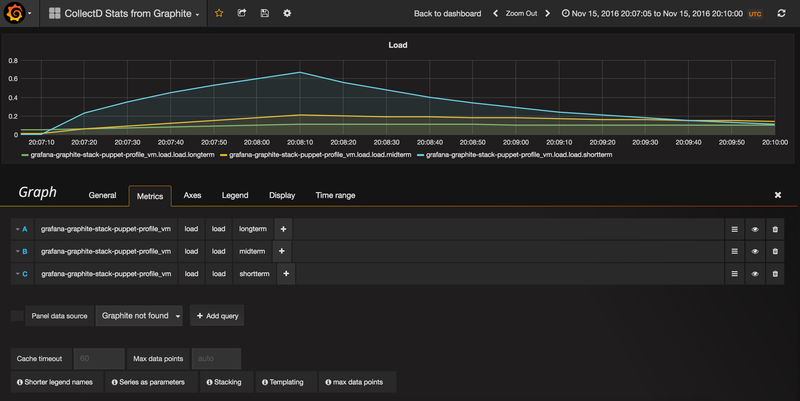 With that in mind, I picked up an a module after someone asked about a pretty common use-case example of setting up Collectd, Graphite and Grafana for systems tracking. It’s been a long time since I last setup Graphite, but I remembered how most of it fit together. Most of this is fairly self-explanatory: configure collectd to monitor load, send that information to the graphite port on 2003. For interfaces, because of the new naming scheme for networks in systemd I did some basic facter checking so it can chose the correct interface to monitor. ==> centos7: Failed to issue method call: Unit iptables.service not loaded. One of the things I was curious about was how Graphite scaled, as it’d been 3 years since I’d last set it up in anger.